For more on the Initiative for Democratic Socialism, click HERE. James Robertson: Let’s start with a brief history of the Initiative for Democratic Socialism (IDS) and its role in the formation of the Združena levica (UL, United Left) earlier this year. What are the origins of IDS? Anej Korsika: The Initiative for Democratic Socialism, to use the old cliche, has a short history and a long past. Officially, the party was founded on March 8 this year. However when one wants to grasp the gradual formation of the party, one needs to take into consideration a much longer timeline. Documentary: Bosnia and Herzegovina in Spring, March 2014. For more on the Bosnia-Herzegovina revolt, click HERE. April 2, 2014 -- Brooklyn Rail -- The perspective of yet one more nationalist clash at the gates of Europe, in Ukraine, doesn’t seem to displease the world’s masters and those who write for them. Things are going differently, at least until now, with the revolt gripping Bosnia-Herzegovina. This movement began in the first week of February with workers’ demonstrations against the consequences of privatisation and an increase in unemployment. These demonstrations took place in Mostar and especially in Tuzla, an industrial city with a long tradition of struggle dating from the “socialist” era. Tuzla was also one of the rare places where the nationalist madness had little following, even in the worst moments of the war of the 1990s. Hundreds participate in the democratic plenums. March 19, 2014 -- International Viewpoint -- Why does Bosnia-Herzegovina inspire so little interest and curiosity in the media and the political class when, on the contrary, Ukraine is front-page news? Is it because of its non-membership in the European Union? Is it because its name evokes the war that, 20 years ago, claimed the lives of hundreds of thousands of men and women -- more than 200,000 dead and 600,000 exiles -- in the face of virtual indifference in the West as to what was happening one and a half hours by plane from Paris? Or because it often wakes up to the call of the muezzin? Yet in recent weeks, this country has also risen in revolt. The people have rebelled against social injustice and poverty and expressed loud and clear their desire for change. 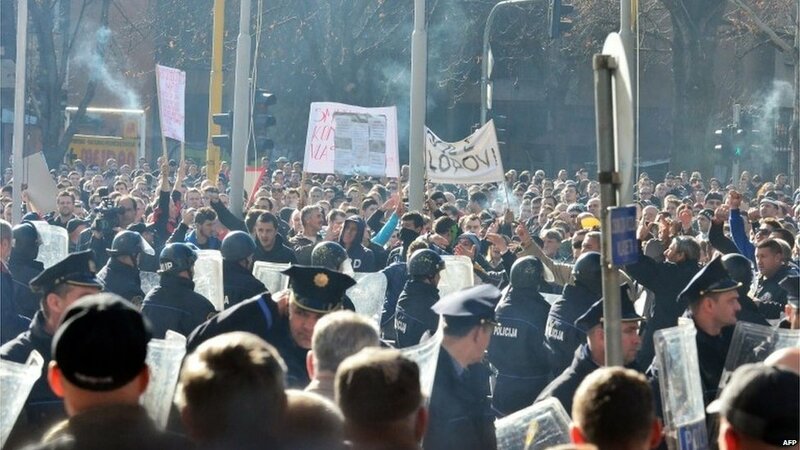 Bosnia’s magnificent uprising: Heralding a new era of class politics? Mass protest in Tuzla, February 7, 2014. 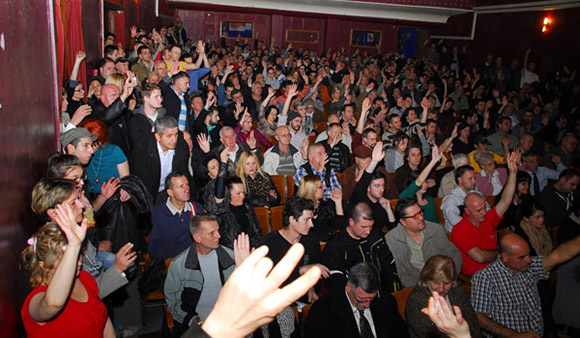 February 13, 2014 – Links International Journal of Socialist Renewal -- Beginning on February 5, mass protests led by workers and retrenched former workers in the privatised factories, along with students and other citizens, have rocked most major industrial cities in Bosnia, notably Sarajevo, Tuzla, Zenica, Bihac and Mostar. Post-socialism, the European Union and a new left in the Balkans: Welcome to the desert of transition! 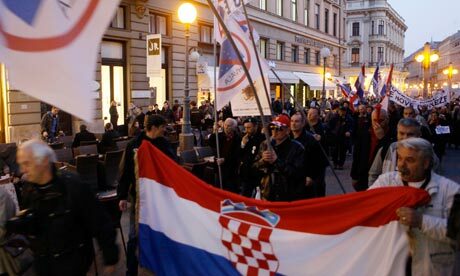 Protesters rally during anti-government protest in Zagreb, Croatia, March 2011. Photograph: Darko Bandic/AP. Aftermath of a NATO airstrike on Tripoli. June 23, 2011 -- Links International Journal of Socialist Renewal -- Renfrey Clarke has written a very detailed and thoughtful piece of discussion, and despite my disagreement with it, I welcome the fact that people are willing to put forward unpopular positions (among the left) and have them thrashed out, especially when it is done in such a careful and thorough way. Skulls of victims of one of the massacres during the 1994 Rwandan genocide are displayed at the Genocide Memorial Site church of Ntarama in Nyamata, Rwanda. Photo: AFP. 112 pages plus endnotes and index, ISBN: 978-1-58367-212-9. June 17, 2010 -- Pambazuka News -- This is a review of Edward S. Herman and David Peterson’s The Politics of Genocide, Monthly Review Press, New York, 2010. August 2, 2008 (updated October 11, 2008) -- The new Serbian government last month finally cornered Radovan Karadzic, the former leader of the Bosnian Serb Republic (Republika Srpska), one of the two entities which make up Bosnia, during the war in 1992-5 when that statelet was created. Karadzic had been in hiding for many years from the International War Crimes Tribunal in, which in 1995 had indicted him for various war crimes including genocide. The July 21 arrest led to a wave of hypocrisy in Western capitals, congratulating Serbia on the arrest of the vile criminal. Yet for the last seven years in Afghanistan and five years in Iraq, well upwards of a million people have been killed as a result of the US invasion and occupation of these countries. Whole countries are being destroyed; yet not only do these war crimes of climactic scale go unpunished, but these leading war criminals then see themselves as having the right to designate who is a war criminal. On Wednesday March 24, 1999, the secretary-general of NATO, former Spanish social-democratic minister of culture Javier Solana, told a press conference: "I have just given the order to the Supreme Commander of Allied Forces in Europe, United States General Wesley Clark, to begin air operations against the Federal Republic of Yugoslavia." The following day 371 NATO warplanes undertook bombing raids and six NATO warships in the Adriatic launched cruise missiles against targets in the Federal Republic of Yugoslavia. Between March 25 and the cessation of NATO bombing raids on June 9, more than 30,000 combat missions had been flown by NATO warplanes against Yugoslavia. Thousands of civilians in Serbia have been killed or wounded. Millions of Serbian workers are now living without electricity, or water, or jobs. Factories, power stations, houses, hospitals, bridges and roads have been destroyed or damaged. The destruction of oil refineries and petrochemical plants have poisoned the air, rivers and soil of Serbia with toxic products. It has been estimated that the reconstruction of damaged or destroyed infrastructure will cost between $US15-50 billion. I feel forced to write to correct some confusion that has been circulating regarding the current US ambassador to Bolivia, Philip Goldberg, who has been supporting the so-called ``autonomy'' referendum by the Bolivian oligarchy. A continuous line has come out that Goldberg ``has experience in partition'' because he allegedly participated in the dismemberment of Yugoslavia. This tends to be a secondary point alongside a more general point that erroneously compares actual oppressed nations, such as the Kosovar Albanians, the poorest people in Europe, who have striven for independence for over a century, with the rich oligarchy of low-lands Bolivia, engaged in an imperialist-backed destabilisation of the Bolivian revolution. Along with Kosova, some also list Tibet and other examples of so-called ``secessionism'' as being related to the Bolivian oligarchy's campaign. One feels compelled to add Palestine, Eritrea, Bangladesh, East Timor, Aceh, Tamil Ealam and other national liberation struggles by oppressed peoples just to make it consistent.